*Updated to show the fabric I used so its a little more helpful! 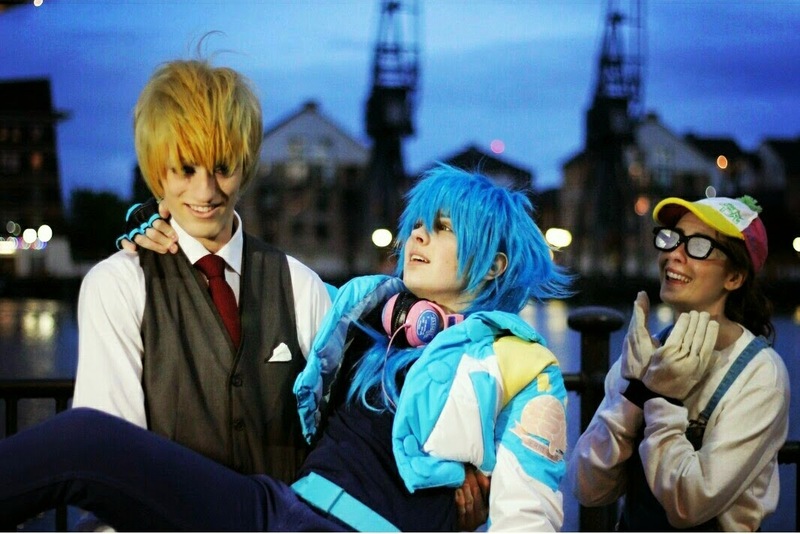 I recently attended London Comic Con in May, for this event I planned to go as Aoba Seragaki for one of the con days. 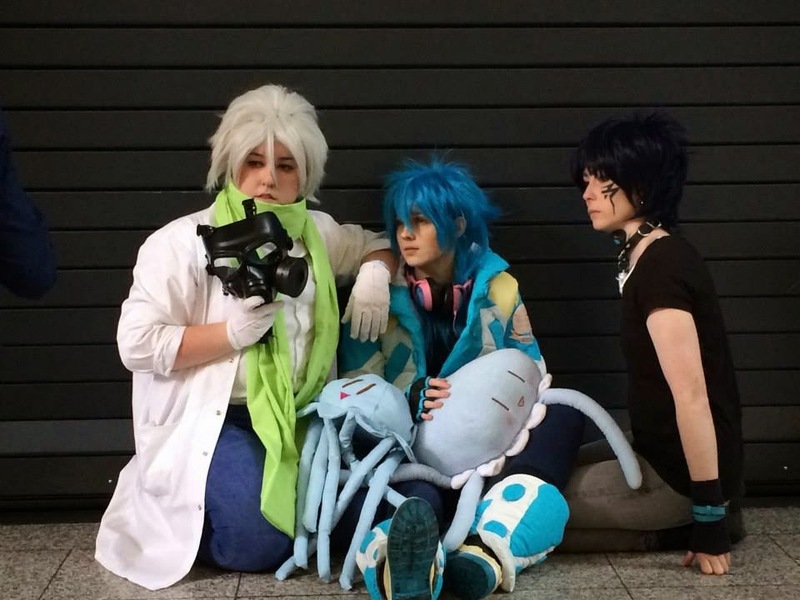 I started making the cosplay around April time, working on it on and off and finishing it (of course) the day before the con, nevertheless it got done! I documented my progress through photos so I thought I'd add them in here to show how it came together. 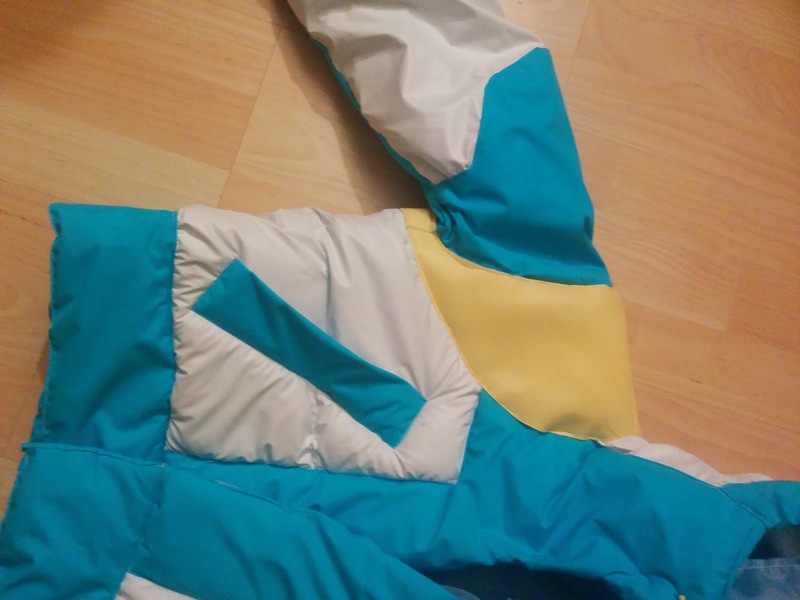 To make the main base of the jacket I used a pattern I used for a previous cosplay and then altered it - This was the pattern using the bottom right design. 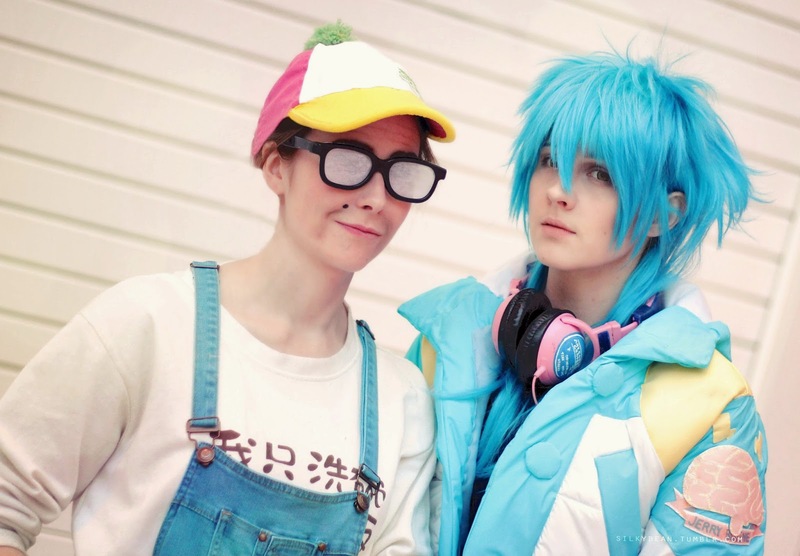 As you can see its not really like Aoba's jacket at all, I'd recommend really searching for a much more similar jacket to his (or at least one that has a hood) to make your life easier. 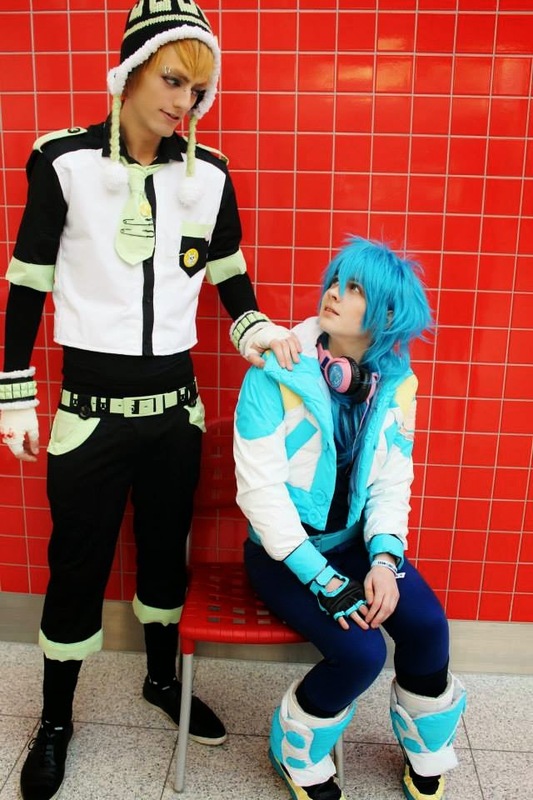 Since I had already sewn this jacket once I kinda already knew how I could alter it. The alterations I made where mostly just to the length, the ends of the sleeves and of course adding a hood. 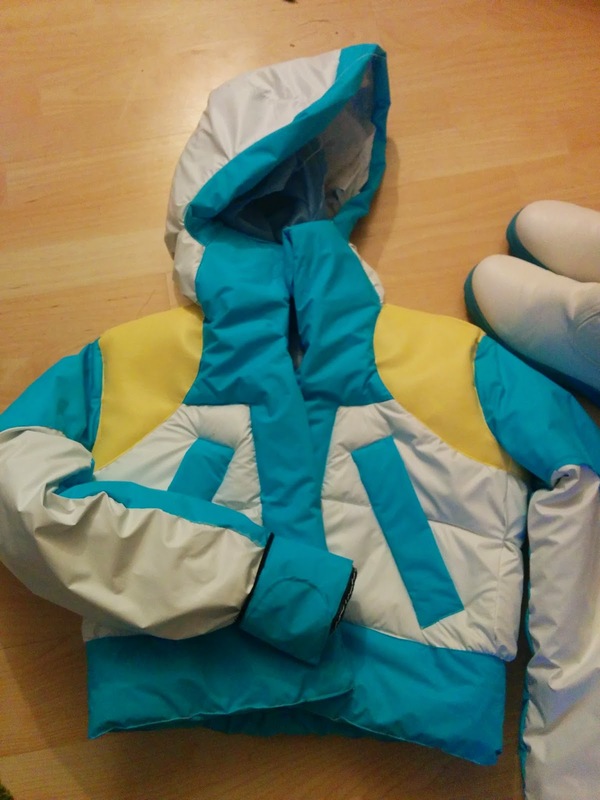 It obviously wasn't in that colour but I can't find the one I used on the site, I chose the blue colour you see on the jacket and then the reverse side is plain white so the whole thing is the same material. 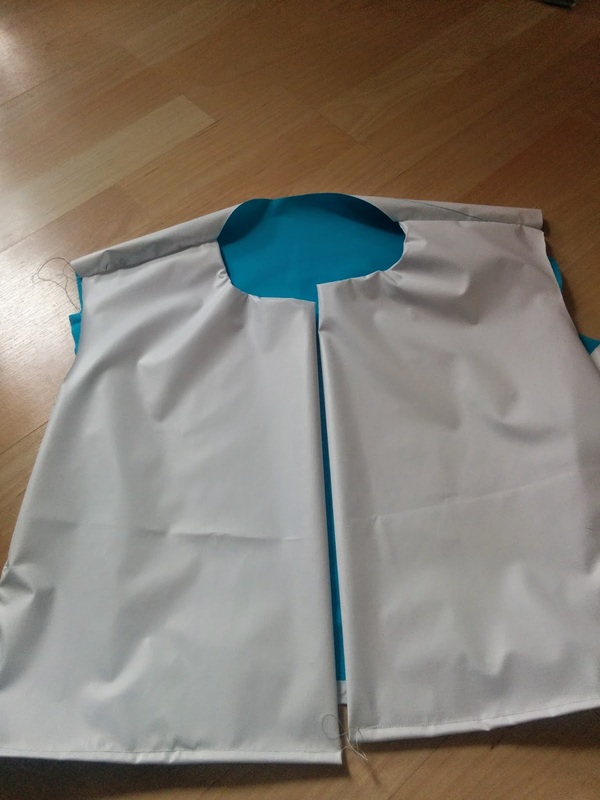 The jacket design I chose allowed me to have the sleeve in two sections so for the under sleeve I used the Blue side of the fabric and for the rest I use the white. All the other Blue areas are sewn on top. 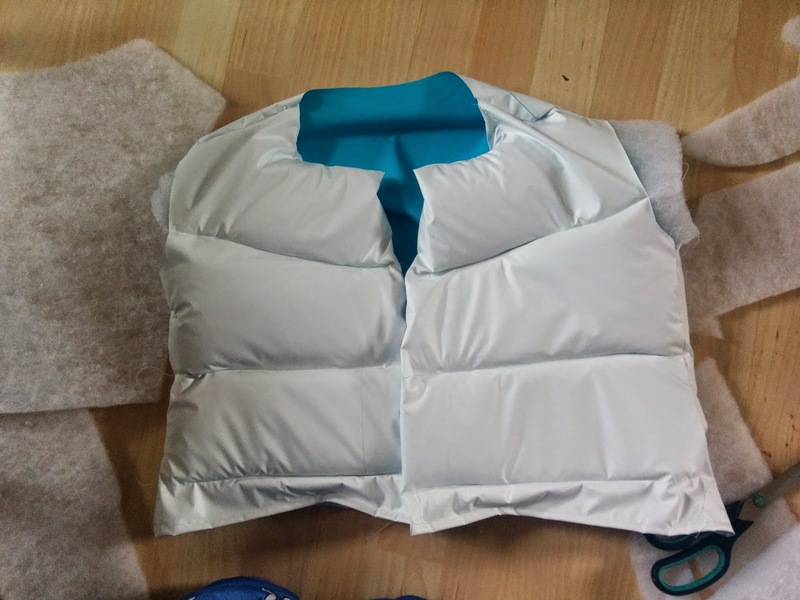 After I'd sewn all the pieces of fabric together I sewed wadding to it to pad it out and make it look more like a puffa jacket like his is. I then sewed on top all the blue details. The hardest part of making the base jacket was the hood as I had no pattern to follow for it. 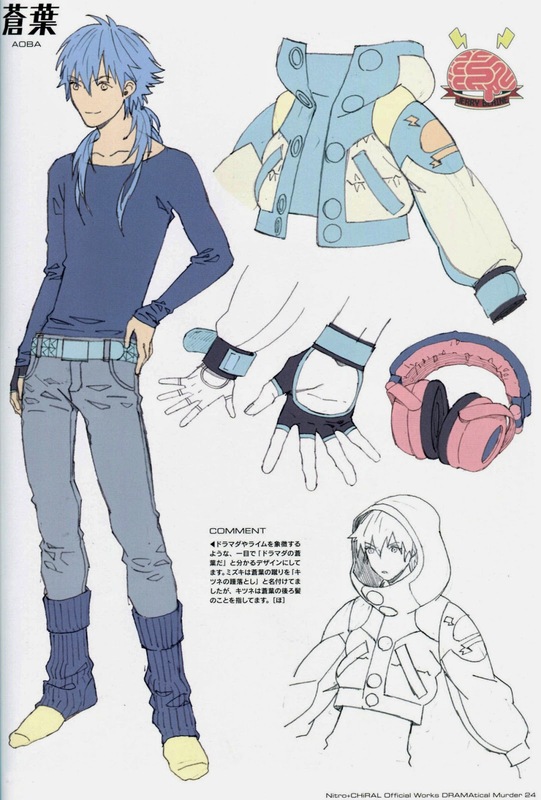 Also I was really keen for it to match Aoba's design which means its really dome shaped when up with a large collar. 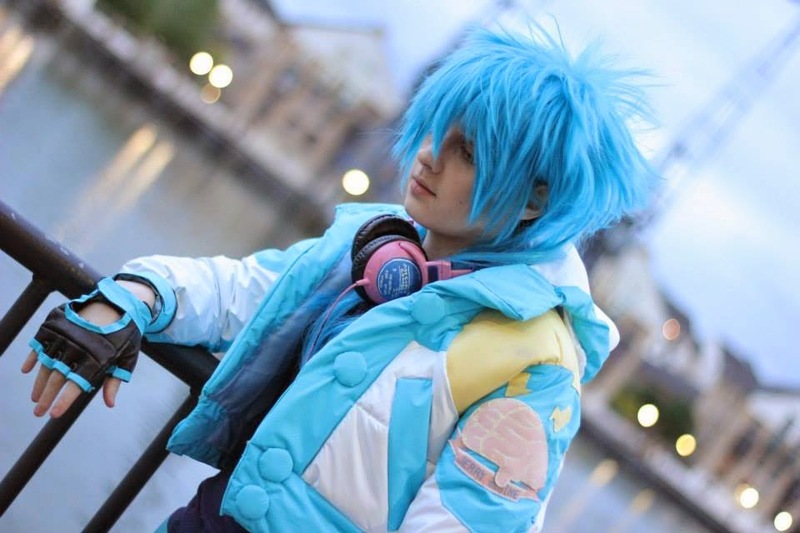 In the beginning the hood was really large and fitted well but I ended up cutting it down significantly so that the collar would sit better (though in the end, it still kind of flops down to the sides, which I see most Aoba jackets do :/) The hood now doesn't really work but in the end he never wears it up anyway, so its fine right? 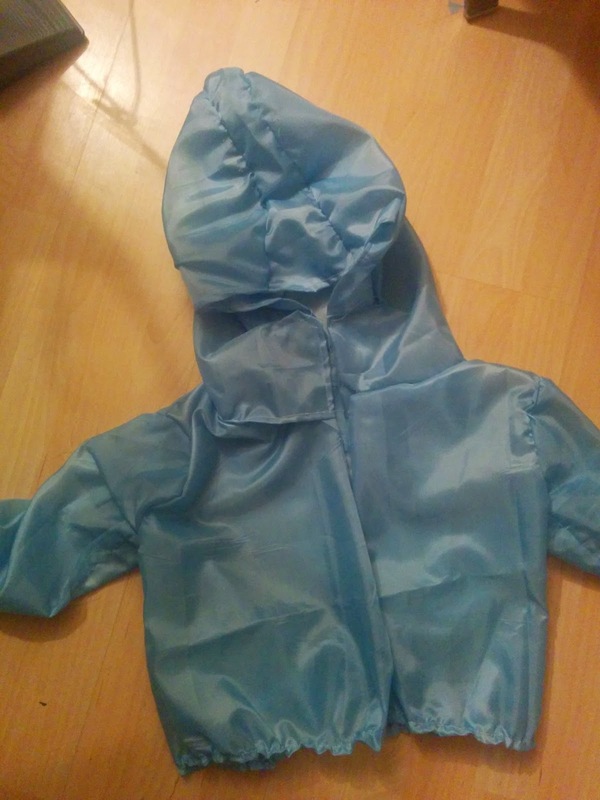 I can't really give advice on this aspect since mine was trial and error, I'd really recommend looking for a pattern for a hood or looking at one you already own to see how it is made to help you. 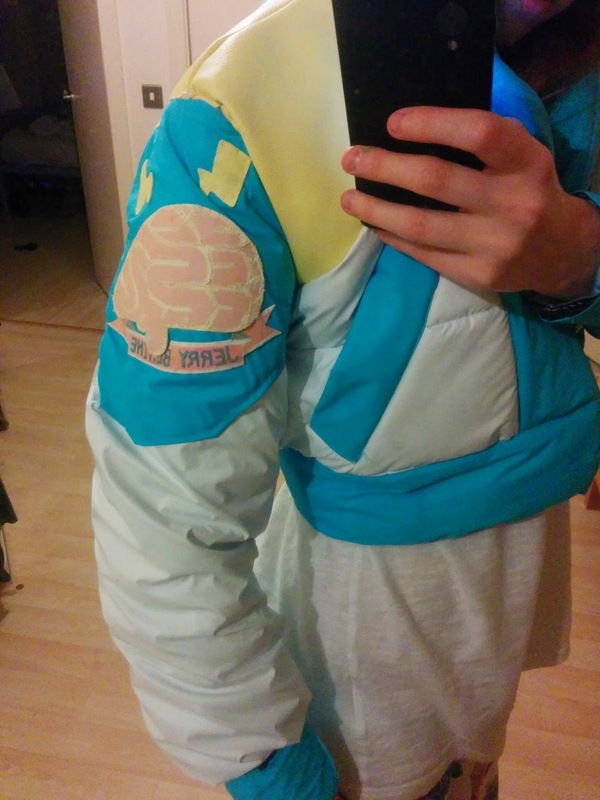 The next stage was sewing the yellow bits on, this was by far the WORST part of the entire jacket and drove me mad. 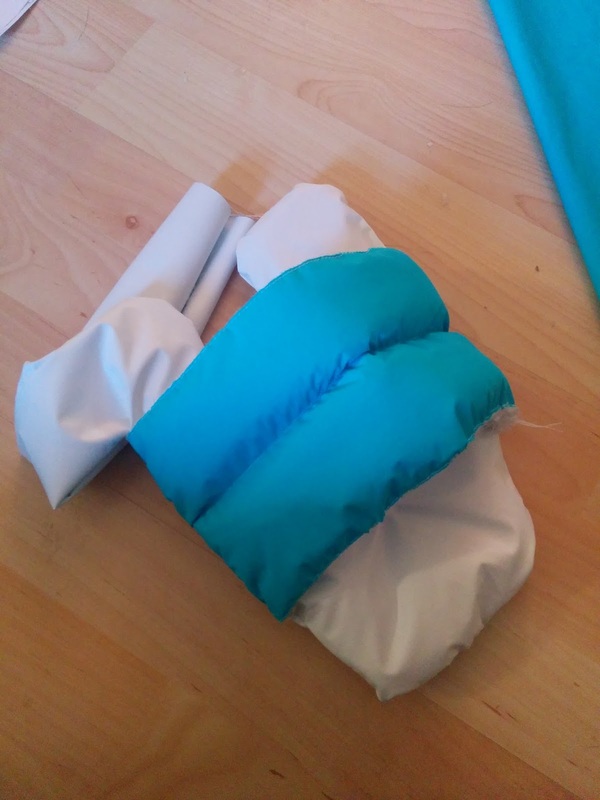 I decided to use some thick leatherette material for it, which was a huge mistake as obviously its really hard to sew, it also punctures easily so any mistakes are very visible. I ended up re-cutting and re-sewing an entire side of it again till I was happy. I think the finish is nice but theres no way I'd recommend doing the same hah. Since I've done a few more cosplays since this one I would sew this yellow section on BEFORE your sleeves/hood etc or you will struggle. I sewed the cuffs on easily enough, the pockets (fake cause I'm lazy) and the lining inside by hand. 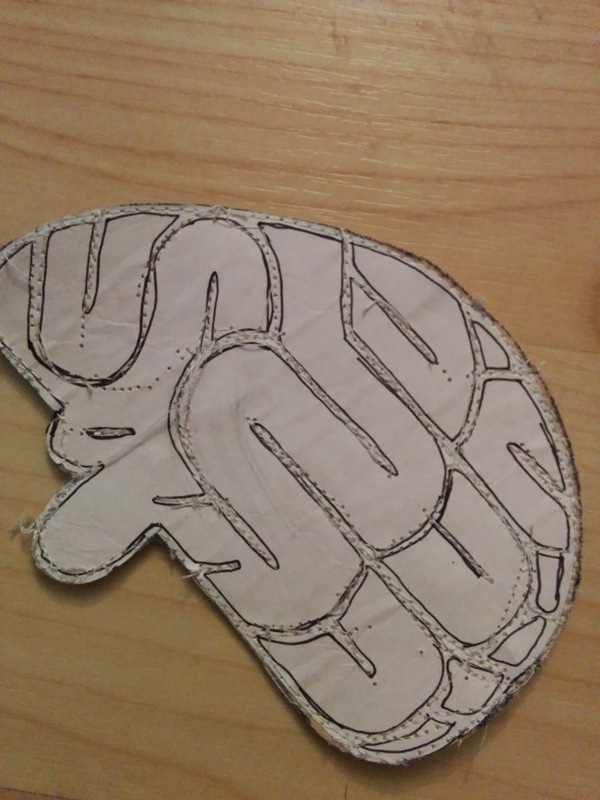 I printed and traced the back of the brain design then attempted to sew over it. 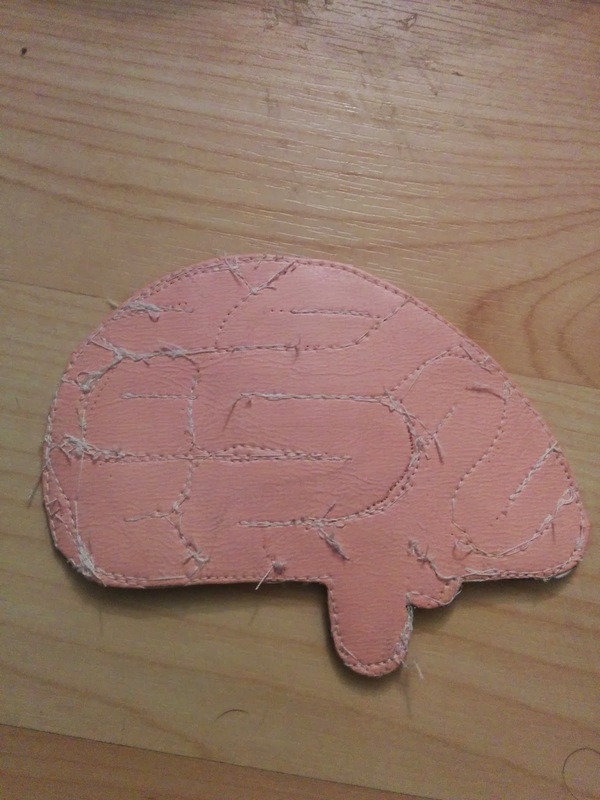 I tried an embroidered style stitch but once again I used leather material (doh!) 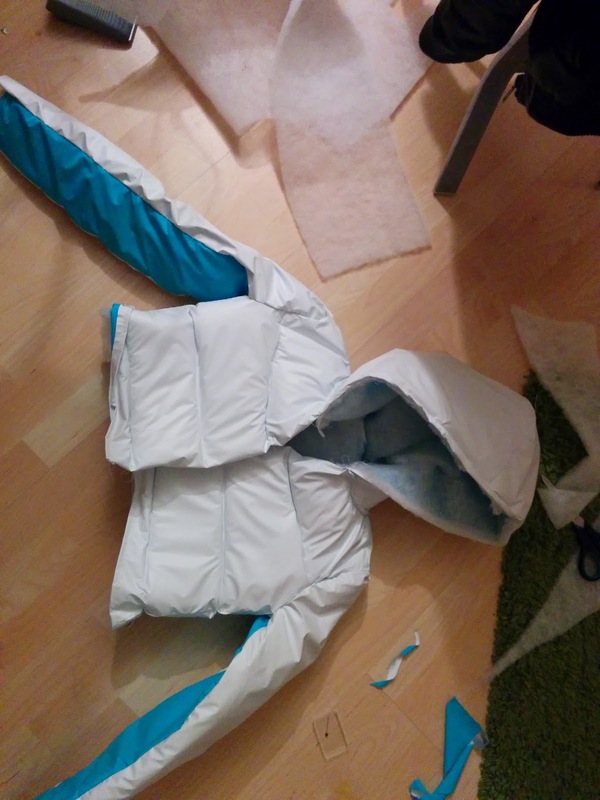 so it was really hard to sew. The bottom 'Jerry' bit was drawn by hand and painted. And volia! Lastly I did the buttons, these were made with pieces of card board, bits of wadding and then the same nylon stretched over the top. Each was hand sewn on. ...and I'm then left with the finished Jacket yay! I seem to have lost the image of the boot plain but basically they were completely white and I painted the black and blue on. The yellow is some leatherette left over from his jacket which I glued to it. 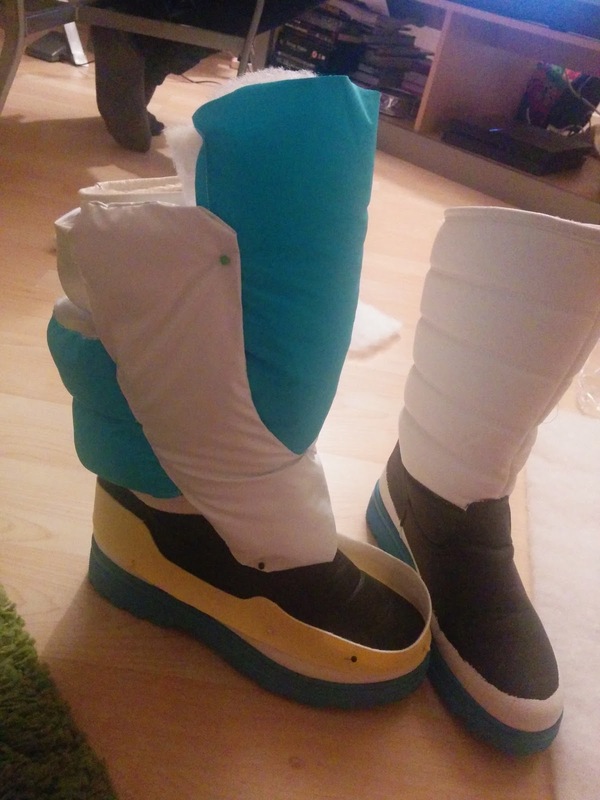 For the puffy bits I decided to make them like boot covers that would slip on and off so that I could potentially reuse the shoes if I wanted (I'll never want to wear them again aha) The material is the same as on his jacket. 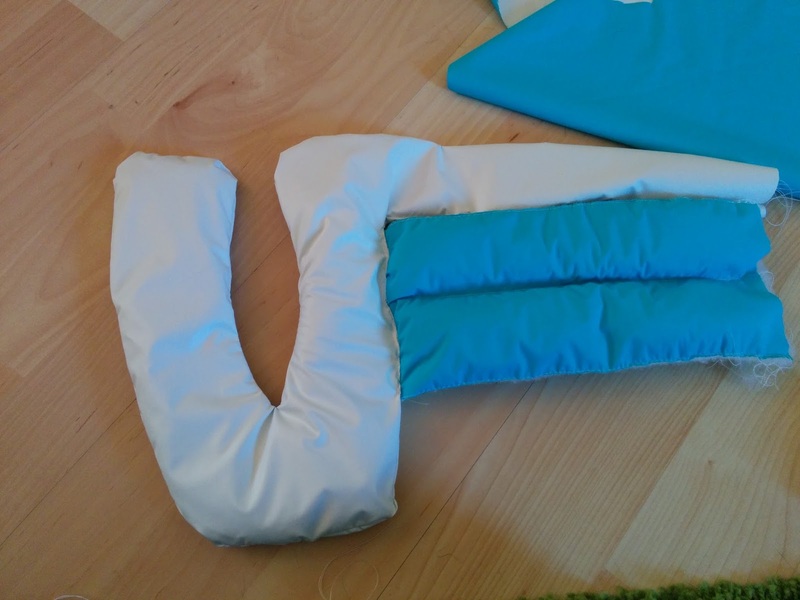 The most difficult bit is making a pattern (I remade it many times). 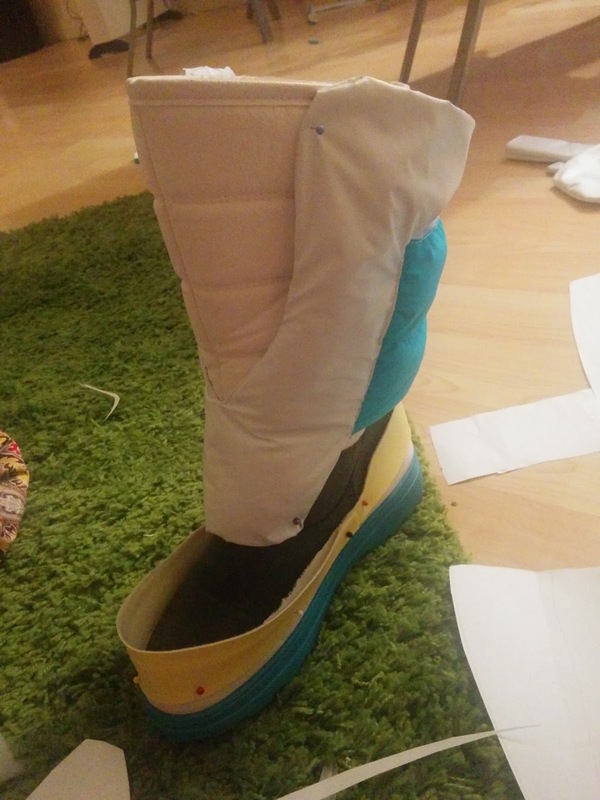 I made a template from paper and pinned it around the shoe to check it fitted. 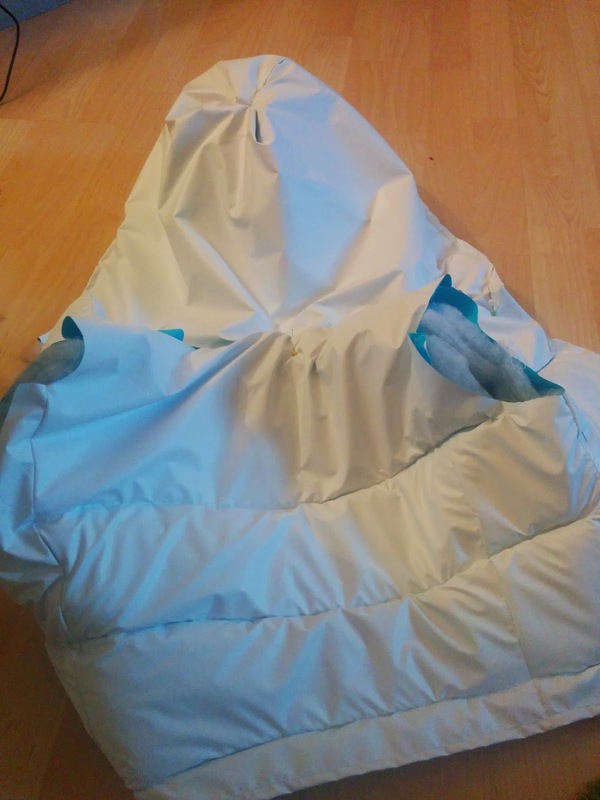 I then cut the fabric larger than the template (so it can be turned inside out and have a neater edge) and sewed the white section - Then I stuffed some wadding inside. 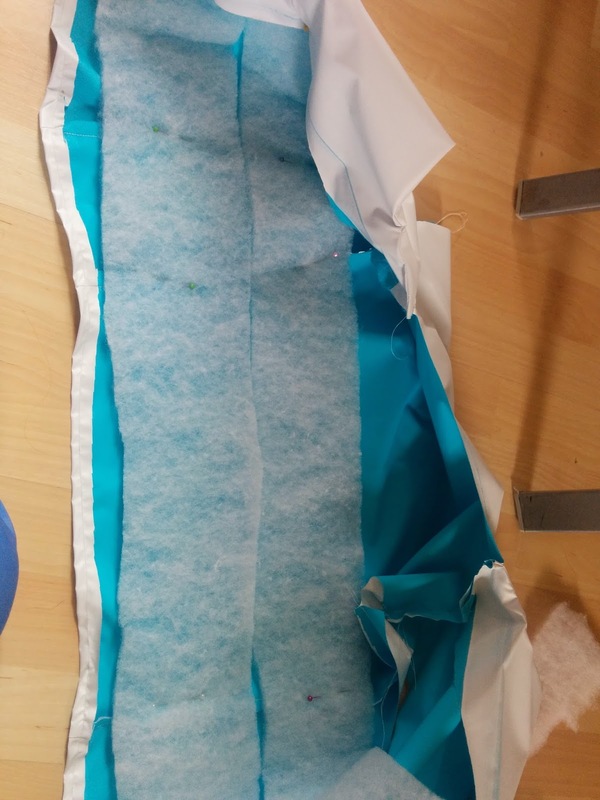 For the blue section I sewed the wadding down the middle to give it that line and then sewed it inside out to the opposite side. 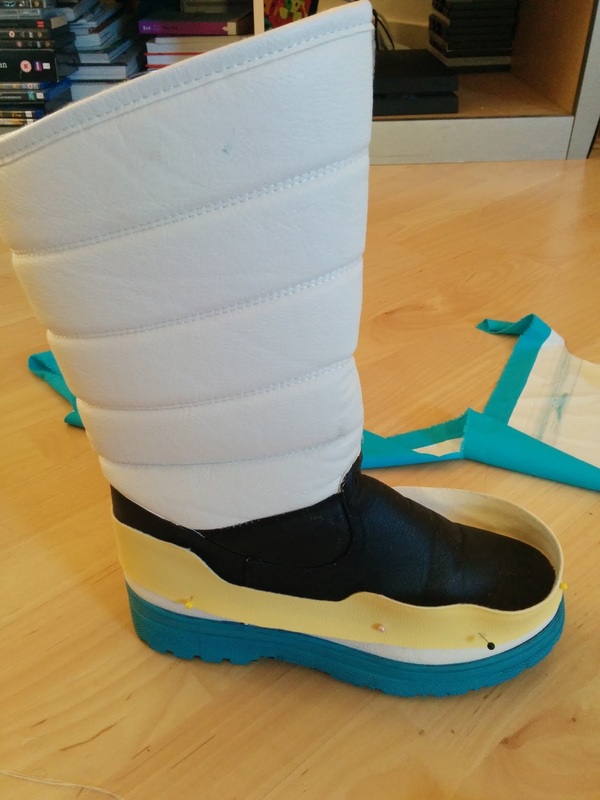 The last bit was assembling this on the boot and pinning the middle blue portion (as shown in above image) in the right place and pinning all the rest together. Since I used wadding there was a lot of hand sewing involved at this point as my machine could not handle it. I also had to hand sew the buttons (made the same way as his jacket ones) and then reinforced them with glue. The last thing I made for Aoba where his headphones and belt but honestly these were just paint jobs and I'm sure there are much better headphone tutorials out there to follow for those!